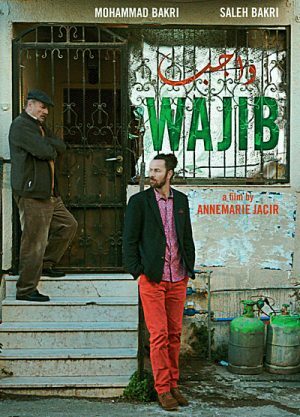 Wajib is a quietly powerful film about the importance of blood ties and the misunderstandings that can happen between generations, especially in a strict society. A son has returned home to Palestine to help his father prepare for the marriage of his sister Amal (Maria Zreik). Together they travel from home to home, delivering the marriage invites by hand, performing their wajib (duty), as is the expected custom. The son, Shadi, has long since made a life for himself as an architect in Italy, living a far more liberal lifestyle than would have been possible back home in Nazareth. His teacher father, Abu Shadi, is a proud, traditional man who deep down does not understand some of the choices made by his son. As the pair (played by real-life father and son Mohammad and Saleh Bakri) drive around town in dad’s battered old Volvo old tensions brew and new ones emerge.